We’d love your help. Let us know what’s wrong with this preview of Nightpeople by Anthony Eaton. Saria has grown up in the secluded valley, Ma Lee her only companion and the old Dreamer Gaardi the only visitor. But that changes when Dariand arrives to take her away. Only now does Sari I’ve come a long way to get you. You’re special. More than you realise. A lot of people have been suffering for a long time so you might have a chance to live. Some have even died for it. To ask other readers questions about Nightpeople, please sign up. Loved this book. I found it in the YA section of the library when I was trolling for some younger fiction. How long has it been hiding there?!? This is a good quality fantasy/dystopian novel. It was in the young adult section but I really am not sure why. The protagonist is a child but all of her companions are much older. Both the plot and the world are built slowly and skillfully as the book progresses. It is a pleasant change to read a book of this genre that does not dump everything into the Loved this book. I found it in the YA section of the library when I was trolling for some younger fiction. How long has it been hiding there?!? Both the plot and the world are built slowly and skillfully as the book progresses. It is a pleasant change to read a book of this genre that does not dump everything into the first chapter. It is pleasant reading a book of this genre that is not a romance novel dressed up as lamb. I loved learning more and more about the characters as the novel progressed. The writing is simple, perhaps this is why it is in the YA section, however this simplicity added to my enjoyment. I read every word, I neither skimmed nor skipped, nothing seemed wasted. I was never subjected to a description of the colour of the protagonist's hair, or the beauty of her smile. The book just told the story and allowed me to imagine the details. I am trying very hard not to describe the plot because the author did such a fantastic job of weaving the details throughout the entire book that I don't want to give anything away. I feel just naming the genre has given too much away. It isn't that there were great plot twists, but there was a sense of satisfaction on learning things. The discoveries felt right, as if they were something you had always known. I liked that. I am so very impressed with this book (have I said that enough yet?). I am so very glad that I borrowed the sequel at the same time (and kudos to the people who wrote 'Book 1' on the cover, all trilogies should be required to do this so that the reader knows!!). Oh and for all those people who thought The Selection had good cover art (not me)... I want to say that this book has good cover art... my kind of cover art. I could stare at that cover for a long time just imagining the world that Eaton has built. Individually, the title or cover alone would have had me interested. But together? I had to read this! The story was a bit slow and fairly uneventful... well, maybe it just wasn't what I was expecting. I don't usually care for dystopian books, but like I said -- the title and cover grabbed me. Plus it's Australian, and I love Australia. It was good, but it wasn't un-put-down-able. Still, it interested me enough that I've already borrowed the second book. I have to mention something that annoyed t Individually, the title or cover alone would have had me interested. But together? I had to read this! First up, Nightpeople was amazing. It was sad, haunting, 'eerily familiar', and it reminded me of what might happen in the future if we don't protect the environment and conserve our energy sources. The story was extremely well written, but the plot was a bit...meh. I pretty much guessed what happened, but there was one unexpected twist in the end about Saria's mother that I wouldn't have guessed. The characterisation was really, really good. Saria was thoroughly believable, and so was Dariand, a First up, Nightpeople was amazing. It was sad, haunting, 'eerily familiar', and it reminded me of what might happen in the future if we don't protect the environment and conserve our energy sources. The story was extremely well written, but the plot was a bit...meh. I pretty much guessed what happened, but there was one unexpected twist in the end about Saria's mother that I wouldn't have guessed. The characterisation was really, really good. Saria was thoroughly believable, and so was Dariand, although he was a bit annoying at times--he's the sort of character that you love and hate at the same time. There was a point in the story when I wasn't sure whether Dariand was a good or a bad guy, and I loved how Anthony Eaton didn't tell us, straight out. I also enjoyed the mystery of the Nightpeople. While Dariand and Saria have to duck or hide every time the Nightpeople patrol the Darklands, in the end when Saria is willingly taken by the Nightpeople, they don't seem quite so bad. I'll find out more about that in the next book. WOW! Seriously, I knew this book was going to blow me away when I reached page 12 (end of the prologue) and literally had to stop to catch my breath. This may well be the most original post-apocalyptic story I have ever read. Not to mention breathtakingly powerful. My only regret is that I didn't also take book #2 with me when I went to my parents' place this weekend, and I'm unlikely to have time to read it before NEXT weekend. This book is set in a post-apocalyptic world. Eaton does a wonderful job of restricting the readers point of view so that you have some idea of what might be going on but are still mystified somewhat like the characters you are reading about. Since I don't have the 2nd book yet I was a little annoyed that there wasn't a little more revelation at the end of this book. Even though this book is almost 400 pages it felt very short. I picked this book up randomly in an airport wanting a good read, and this is what i got!! A fascinating read, easy, and a great concept. More of a teenage read, but an awesome creative escape! The story of a future our children's children may encounter, strangely, it seems realistic in a crazy kind of way. It was great to read a story that was based on Australian landscapes, and mostly around Perth too. It made the scene more easy to imagine and even more real for me. May have done a happy dance hen I realised this was set in Australia :P Great si-fi novel, kept me guessing as its one of those books that only tells you what you need to know at the time and everything else is in the dark. Unfortunately this one didn't make it to the end, just not the right read for me at the moment... while the concepts were a fascinating mix of sci-fi, fantasy and drama, and the setting was hauntingly familiar, I wasn't drawn into the story of Saria - last child of the Darklands. Perhaps will try read again one day, as the author's work had shadows of oppression of indigenous people/environmental destruction, which are important themes to weave into an Australian futuristic novel. I had a lot of down time on a trip when reading this and finished in just a few days. Otherwise, I might have felt that it was taking to long to get deep into some of the characters. It did hold my attention as I enjoy apocalyptic dystopian stories, but this one seemed to use a lot of pages repeating itself before getting to the real meat of things. I will probably still read the next book, even though the storyline is a bit predictable. I was inclined to read ‘Nightpeople’, the first novel in Anthony Eaton’s Darklands trilogy, because I would be going to a workshop run by him at the Sydney Writers Festival. To tell you the truth, I hadn’t heard of Anthony Eaton before and wasn’t really sure what to expect from one of his books. I found myself browsing the library and under his name found a variety of books from several different genres, by was ultimately drawn to his fantasy novels. Nightpeople is set in a dystopic version of wh I was inclined to read ‘Nightpeople’, the first novel in Anthony Eaton’s Darklands trilogy, because I would be going to a workshop run by him at the Sydney Writers Festival. To tell you the truth, I hadn’t heard of Anthony Eaton before and wasn’t really sure what to expect from one of his books. I found myself browsing the library and under his name found a variety of books from several different genres, by was ultimately drawn to his fantasy novels. Nightpeople is set in a dystopic version of what is very similarly described as an ‘Australian desert landscape’. The surroundings are desolate, sandy and full of Australian fauna such as lizards and wild dogs. It is the people, however, that set this novel apart from the country many of us call home today. The novel is written mainly from the perspective of Saria, who is taken from everything she knows out into a world she has never seen, and told that she has a destiny to fulfill, and she cannot know anything about it. The premise of this books was interesting, but I just couldn’t get into it. At times, I wanted to put it down because there just wasn’t enough happening to hold my interest. The concept was interesting, as was Saria’s ability to slip into the minds of animals. I have always wanted to see the world from my dogs’ eyes, and Saria got to do just that! Quite a lot of the plot is left unexplained, obviously leading up to the other two books in the series, titled ‘Sky Fall’ and ‘Daywards’, though I found this a little annoying as very little is revealed in the book, though there are a few plot twists that I guessed, though that’s not really unusual. The characters were interesting, and each was different, though I found myself having a mixed bag of reactions towards one of the main characters, Dariand. One minute I hated him, the next I didn’t mind him, the next I hated him again. Truthfully, I wasn’t sure what to think. I apologise for my short review, but it has been a while since I read this and I hadn’t been able to get to the review until now – oh, and stupid me didn’t take notes while I was reading this one! So I’m going to stop now before I start babbling about something that didn’t actually happen. It seems fitting that, after reading an Australian YA book anticipating the end of the world, that I read some post-Apocalyptic YA. Nightpeople, the first of Tony Eaton's Darklands Trilogy, is set in a desolate wasteland - the Darklands - where the remnants of humanity struggle to survive. Most children are born deformed, with no chance of survival, and those who are born pure are taken away by the mysterious Nightpeople who fly in on their machines when a child is born. Saria is the last of the D It seems fitting that, after reading an Australian YA book anticipating the end of the world, that I read some post-Apocalyptic YA. Saria is the last of the Darklanders to be born pure, and hidden away at birth by the Dreamers. Many years later, as a teenager the time has come for her to return to the Darklands, as her people's final hope for survival, as she starts to discover her hidden talents that have been passed on to her by her mother... but there are those who would sell her out to the Nightpeople, as life becomes more desperate for the Darklanders. This is a compelling work of speculative fiction, creating an evocative vision of Australia in the distant future - indicated by familiar (albeit distorted) place names such as Woormra and Coob. Whilst it draws from numerous tropes of the genre (i.e. Last of her people, mutations from nuclear contamination) it is still distinctly Australian in its landscape, and its characters. Though not overly explicit, themes echo the political issue of Australian's "Stolen Generation" of Indigenous people - a hot topic around the time of the book's publication, further alluded to by drawing from Indigenous spirituality, with Saria's connection to "earthwarmth" and her relationship with the land. Post-apocalyptic world. A desert environment with distinct boarders and what lies beyond these is unknown. The people left have dispersed into villages which are poverty stricken. Even though it is never fully revealed, the history we learn of the place hints at a nuclear type accident. Saria – the last of her kind, the final child of the Darklands. throughout the novel She must survive unseen by the Nightpeople and realise her power and potential to the Darklands. She learns that the she plays an important role in any future for the people of the Darklands. She must learn to let go of selfish notions and surrender her fate to that of the Darklands. Births are rare and survival of healthy baby rarer still. Healthy babies are taken by the Nightpeople. One healthy baby is hidden and raised in a secret valley. The story centres on her journey back to her village and learning of the past which has shaped the place and people. There is a strong environmental message – a theme of “listening” to nature and working with the earth as opposed to plundering it for our own needs. There is a fundamental belief in citizenship that what we contribut is more important than any of our talents or individual needs. A good read. Opening is excellent. then the plot development is a little slow – not a page turner. Good character development and I was hooked by the end. Keen to read the next in the series. 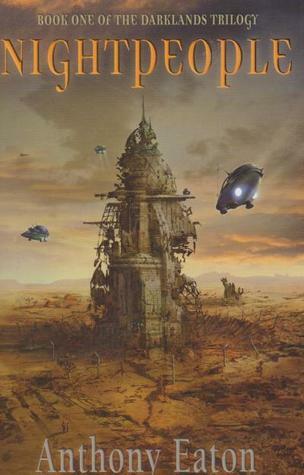 Recommends it for: Aficionados of Australian fantasy and dystopia. Nightpeople hooked me from the start, a first book in a fantasy trilogy that I feel could aklso class as Sci-Fi and definitely as dytopian. Set in a sparse desert, a small and dying people have obviously lost all modern science and are clearly living in radioactively contaminated areas. There are still technologically advanced people, these are the nightpeople who appear in aircraft to take away any infants born in the arid lands. There is of course resistance to dying out and some babies are hidden, this story follows the journey of one of these hidden children as she is fetched from the hidden valley where she grew up. This is the outline, what I enjoyed most about this book though was the understated yet deft and absorbing writing style. No strong mention of time and place ruffles the story but the vivid descriptions of the Australian deserts are intoxicating to anyone who has enjoyed travelling through them. The characterisations of individuals are vivid and believable, none of them are perfect or always wise but they are more believable for that. There are strange and shamanistic powers in a few of the cast, but they meld seamlessly into tracking and desert wise skills that you would see in people living in harsh environments, and this makes these powers feel less 'fantasy' and almost practical. I'd wager that the author of this book is or was a fan of John Wyndham's The Chrysalids. That aside, it takes a little time to get going and when the book is in motion, it's an engrossing and uneven ride. This story promises so much and does it continue the good work it started in the next two books? Read my reviews and find out. This is a good "first of the trilogy" book. Engaging with a touch of mystery, I had to read the next book to find out what happened. I was pleased when the final book in the trilogy was less predictable. I tried to like it. I really did. I could not finnish it. I still have it for now but I can't seem to pick it up. Born in Papua New Guinea in 1972, ANTHONY EATON spent an idyllic childhood growing up in the Perth hills, and on the Cocos (Keeling) Islands. He attended High School and University in Perth, and studied a plethora of subjects before settling on a career in Teaching. He worked at Trinity College in Perth as a Literature and Drama teacher for eight years, during which time his first novel, 'The Darkn Born in Papua New Guinea in 1972, ANTHONY EATON spent an idyllic childhood growing up in the Perth hills, and on the Cocos (Keeling) Islands. He attended High School and University in Perth, and studied a plethora of subjects before settling on a career in Teaching. He worked at Trinity College in Perth as a Literature and Drama teacher for eight years, during which time his first novel, 'The Darkness' was published by the University of Queensland Press. The novel was awarded the 2001 Western Australian Premier’s award for Young Adult Literature, and encouraged Anthony to turn his hand to further writing. In 2005, his historic fiction novel Fireshadow also won the WA premier’s award for Young Adult Literature and was named an honour book in the CBCA Book Of the Year awards. His most recent book is 'Into White Silence', an historic Gothic novel set in Antarctica at the turn of the century, and dealing with the disappearance of an expedition to reach the pole from the East Coast of the Antarctic Continent. As a part of this, he spent Christmas 2005 at Casey Station in Antarctica as part of the Australian Antarctic Division’s Arts Fellowship programme. In April 2009, 'Into White Silence' was selected as an Honour Book by the Children's Book Council of Australian in the 'Older Readers' category of their annual 'Book of the Year' Awards. In 2010, Daywards the long-awaited final book of his Darklands Trilogy will be released. He's pleased to finaly have this story out of his head.